Iranian people and the question of political prisoners in Iran! keeping the status quo or take united action to release political prisoners ??!!! Narges Mohammadi the vice president of the Association of Human Rights Defenders in Iran , in an anguish letter written from "Zanjan" prison explains about her illegal arrest , left alone in solitary confinement , agony and suffering of a mother being separated from her two little children and dangerous illness that threatens her life. She wrote: " Writing isn't easy for me ,but i tell and write so that it won't happen to any children .......depriving the children from this love and to bring suffering on mothers from this separation ,is an unforgiving sin ....and i wrote this letter from within the walls of this prison with thousands of hopes ,so that way sooner and with the mercy of God , in this land or any other lands on the earth , these agony will vanish...i have faith, that day will come, even if i won't be here, the result from this painful love ,will bring better future for my children and all the children of Iran and even the world . " Who is responsible of this pain ? And who shares this pain with me? Iran's Despot ( Islamic style dictatorship of Khamenei in Iran- Dictator in the name of God) standing on OIL barrel ! 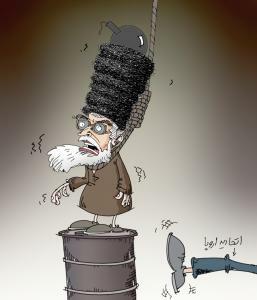 Cartoon by : Eqbal Mahouri - Cartoon shows Khamenei with grenade on his turban standing on top of an Oil Barrel with rope around his neck and European Union is kicking the barrel. 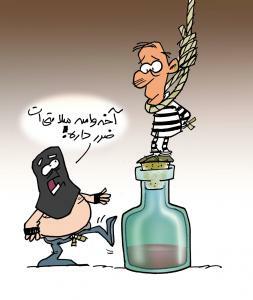 (New York, June 29, 2012) – Iranian authorities should immediately suspend all use of the death penalty, Human Rights Watch said today, after reports that two death sentences for drinking alcohol issued by a lower court had been upheld. Iran should abolish the death sentence completely for crimes that are not considered serious and exceptional under treaties that bind it, and provide further public information regarding the case against these individuals. According to Iran’s penal code, consumption of alcohol is a hadd crime, or a crime against God, for which shari’a, or Islamic law, assigns fixed and specific punishments. The usual punishment for consumption of alcohol is 80 lashes, but article 179 of the code provides that individuals with two prior alcohol convictions will receive the death penalty upon their third conviction. The law allows a court to ask the Supreme Leader or his representative, usually the head of the judiciary, for clemency if defendants repent after being convicted of the crime based on their own confession. Clemency is not an option, though, if the conviction was based on witness testimony. It is not known whether the defendants in this case have repented, or whether their convictions were based on witness testimony or their own confessions. Human Rights Watch has not been able to find any record of a case in the past 10 years in which authorities carried out an execution order against a person convicted of consuming alcohol. In 2007, branch 72 of the Tehran’s provincial criminal court sentenced a 22-year-old man named “Mohsen” to death after authorities arrested him for consuming alcohol for the fourth time. Qods online, a pro-government media outlet, reported that the court requested and received amnesty from the head of the judiciary on the defendant’s behalf and that he was subsequently released. His conviction was based on his own confession, the report said. In June 2006, Amnesty International reported that Iranian authorities commuted the death sentence for consuming alcohol of Karim Fahimi, also known as Karim Shalo, and released him after he repented. A criminal court in the city of Sardasht had earlier sentenced Fahimi to death after he had been convicted of the crime on two previous occasions. New penal code provisions in January passed by Iran’s parliament and approved by the Guardian Council, an unelected body of 12 religious jurists charged with vetting all legislation to ensure its compatibility with Iran’s constitution and shari’a, or Islamic law, retain the punishments of flogging and death for people convicted of consuming alcohol. Cyber-police in Hamadan said the editor of a social network page “insulting Islam and the Shiite imams” was tracked down and arrested on 25 June. Reporters Without Borders is not yet able to confirm the exact number and identity of all those who have been arrested on similar charges in the past few days. According to the information obtained by Reporters Without Borders, the Organized Crime Surveillance Centre, an agency created by the Revolutionary Guards, has played an active role in identifying and arresting the netizens. Those arrested are currently being held in Tehran’s Evin prison, where they have been placed in isolation cells in Section 240 (controlled by the Revolutionary Guards) or in Section 209 (controlled by the intelligence ministry). Yashar Khameneh, an Iranian student based in Europe, wrote in his blog on 26 June: “My father, Abbas Khameneh, has been a hostage of the intelligence ministry for the past five weeks. No charge has been brought against him, and he has not been allowed to speak to a lawyer or receive visits. He was arrested because he is my father. This is not the first time that the regime has threatened the families of journalists based abroad or has used intimidation as a way of imposing its law on the media. Steven W. Korn, the head of Prague-based Radio Free Europe / Radio Liberty, and Arman Mostofi, the head of Radio Farda (Radio Free Europe’s Persian section), reported on 12 June that threats to the families of foreign-based journalists working for Radio Farda have intensified in the past year. 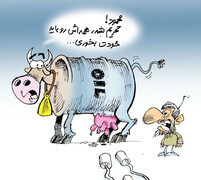 Cartoon regarding the upcoming Oil Sanction ! Cartoon by : Nik Ahang Kousar the Iranian Cartoonist. An MP of the sixth parliament : i'm certain that the security agents murdered my daughter and i won't keep silence ! Mr. Mohammad Bagher Bagherian nejadian Fard an MP of the sixth parliament of the Islamic Republic in an interview with International Campaign for Human Rights said: "I'm certain that the security agents killed my daughter.The intelligence forces of the Islamic Republic made all the criminals in the history to be proud of themselves." Mr. Mohammad Bagher Bagherian N.F. 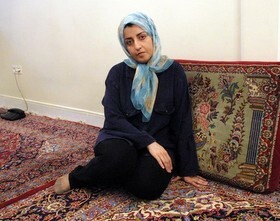 the MP said ; During the last year, he has written many letters about the disappearance of his daughter "Fatemeh Bagher Bagherian Nejadian Fard" to the officials including to the leader of the Islamic Republic ,but was threatened by the security forces to keep silence or else his other children will face the same fate. the case file is still open in a court in the city of "Ray". Fatemeh was 28 years old and was in the last year of Engineering class of " Elmo Sanat "University. She was a supporter of Mir Hossein Musavi the presidential candidate (three years ago). She left home on Thursday July 28,2011 and did not return home ,her body was found on the mountain outside of the city (Shah Ray). Her family was threatened repeatedly to keep silent on the issue . Islamic Republic is planning to execute two people with liquor offences! Cartoon by Nik Kowsar the Iranian Cartoonist which says: Because it's bad for your health ! Bahman Ahmadi-Amouei the Iranian journalist's life is in Danger ! 1- Bahman Ahmadi-Amouei the Iranian imprisoned journalist was in Evin prison for the last three years, but recently the prison officials decided to transfer him from Evin prison to Rejaei Shahr prison in the city of Karaj. Bahman was arrested with the wave of arrest of journalists ,writers , human rights advocates and thousands of other Iranian three years ago after the presidential election coup. Bahman Ahmadi-Amouei was transferred because of his protest on his situation inside the prison and the rights of political prisoners. Bahmen is now in a solitary confinement ward number one of this prison, where they keep prisoners going to be execute.Bahman is the husband of journalist Jila Baniyaghoub. Mohammad Sediq Kaboudvand in his 32nd days of hunger strike ! 2-Mohammad Sadiq Kaboudvand the Iranian-Kurdish journalist and president of Kurdistan Human Rights Organization is on hunger strike for 32 days now. He started the hunger strike on Friday May 25,2012 in protest against decision not allowing him to visit his son who suffers from cancer.public Prosecutor in response to the hunger strike said that ,the life or death of political prisoners is not important for us.The Islamic Republic judiciary sentenced Mohammad Sediq Kaboudvand to 11 years imprisonment. In protest against Islamic Republic judiciary and in support with Mohammad Sediq ,the Kurdish political party's and organizations called June 30 ,2012 as a day of Kurdish people's support for Mohammad Sediq Kaboudvand. (New York, June 21, 2012) – Iranian authorities should immediately provide information regarding the whereabouts and well-being of seven men from the country’s ethnic Arab minority who are known to be in Iranian custody, Human Rights Watch said today. Human Rights Watch is concerned that prison authorities in the southwestern city of Ahvaz may have executed at least four of the seven men in recent days, and have so far refused to hand over the bodies to their families. Iranian authorities should immediately suspend use of the death penalty, Human Rights Watch said. Sources close to the families of three brothers – Taha Heidarian, 28; Abbas Heidarian, 25; and Abdul-Rahman Heidarian, 23 – told Human Rights Watch that on June 17 authorities notified the family that the three had been executed. Two weeks ago, prison authorities had transferred the brothers, along with three other prisoners, from Karun prison’s general ward to an unknown location. Another brother was arrested and also taken to an unknown location when he inquired about their whereabouts. The brothers’ families had not received any information since their transfer, raising fears that four of the men, who had been sentenced to death, would be executed within days. The fourth man believed to have been executed is Ali Naami Sharifi. 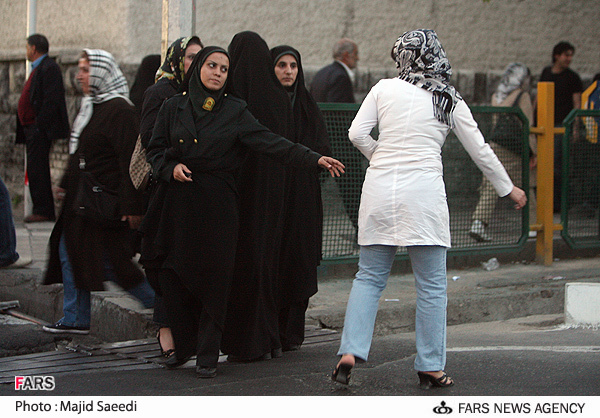 This is Islamic Republic of Iran , wome agents with black " chador" Veil arresting an innocent Iranian women who love and like to wear what she likes. I don't think the Middle Eastern people ( although Muslims ) want to experience this - Middle Eastern people must take this experience seriously and say NO to any Islamic regime and bring a democratic Government. Former Egyptian President Hosni Mubarak 'clinically dead'- No condolence and Sympathy for dictators- These monsters kept their country backward despite of effort by freedom loving people of Middle East for reform and democratic changes. FOR NEDA (English)- June 20,2009 world will never forget. The Islamic Regime in Iran killing its own people - also moslem people - A lesson for Middle eastern people struggling for democratic changes- Middle Eastern must take the experience of Iranian people seriousely and say NO to any Islamic regime !!!!! Islamic regime in Iran hanged three member of an Arab family in the city of Ahwaz ! 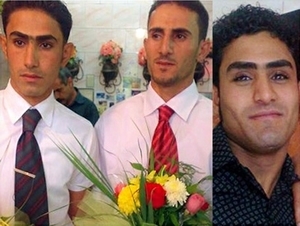 News indicate that ; Islamic Republic in Iran executed three members of an Arab family in the city of Ahwaz -South of Iran on Monday , regime also has executed the fourth person,reported human rights activists in the city of Ahwaz .three brothers executed are : Abas Heydarian with middle name as" Jasem" , Jamshid Heydarian with middle initial as "Teh" and Abdolrahman Heydarian with middle name as " Naser". the judiciary officials in a letter reported about the execution to their family. The forth person executed is Ali Neami-sharifi - and their is no news about the fifth person Amir Moavi - all those executed are under 30 years of age.They spent one year in prison before brought to execution. On Monday afternoon people of Ahwaz reacted to these execution by coming to the streets and protested against the Islamic regime in Iran. IRAN WATCH CANADA: I don't know what to say to these barbaric Islamic policies. These Islamic officials are responsible to the killings - They lack even common sense and they should be punished for these ????!!!!! An uprising is on its way,said Amirarjomand the adviser for Musavi ! 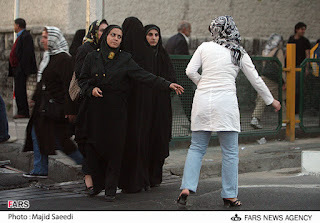 1- On June 14 ,2012 for the fear of people's protest regime had brought all its oppressive forces in the streets around the major cities in Iran. The repressive forces were on alert because of the call by "council of the Green Path of Hope " for a silent march on June 14,2012 from 7-9 pm. Mr. Amirarjomand the adviser for Mir Hossein Musavi ( Presidential candidate of June 2009 who is currently under house arrest together with Karoubi the other candidate )on the future of Green Movement said that ; he is not disappointed for it is taking long for people to rise again and is hopeful for the future and regime suffers from severe crisis and people are looking for an opportunity to come to the streets and willing to pay the price and an uprising is on its way " . 3- 10,000 worker from many factories in five provinces wrote a protest letter to labor minister and complained about the labor policies and delay in paying their salaries and their situations and the rise on basic food prices. in another news on last Friday regime security forces in an ambush to a house in Karaj arrested more than 60 labor activists.There is no news why they were arrested. Mahmoud Salehi one of labor leader is among those arrested. Students protest on June 13,2012 in Petrolume college in Ahwaz. The plain cloths agents of Sepah, Ministry of Information and "Herasat" at the college attacked students.some of the students are wounded and some are arrested ! day after day people's anger adds up against this Islamic regime. regime is drunk of power - continue to suppress the Iranian people - This video shows young and old Iranian fight with regime militia in and around freedom square in Tehra. A video from the lens of regime's militia- This video is taken during uprising three years ago in the streets of Tehran. Sham-Dara in Syria13-6-2012 Syrian continue to fight against Bashar Al Asad. Dictators are stupid In history,They experience the experience. But Syrian people must also look at all angles for change - A true democratic change - creating their civil rights and social women,students ,labor grassroot organizations now . struggle must continue in different angles. The world should focus and support the people of Middle East against reactionary regimes like Saudi Arabia and Islamic Republic regime in Iran . Mehmanparast the Iranian Foreign Affairs spokesperson: Mahmoudreza Khavari did not accept meeting with Iranian officials ! Mehmanparast the spokesperson for the Iranian Foreign Affairs said that: "Mahmoudreza Khavari did not accept meeting with the Iranian officials. Canada must respect to the rights of Iran and make efforts in returning Khavari to Iran. We have invited the Canadian police officer in Islamabad (Pakistan) to Iran . Ministry of Foreign Affairs will make efforts to return Khavari to Iran. " reported ILNA ( The Iranian Labor News Agency) . Mr. Mehmanparast said: "We have requested to have a meeting with Khavari and to speak about his return to Iran.Khavari did not accept the request for the meeting and did not attend in that meeting . We will continue to follow in his return to Iran." "We have made many activities through Interpol and subpoena was issued in Khavari's arrest, even we have invited the Canadian police officer in Islamabad( Pakistan) to come to Iran for negotiation in this regard,and he admitted the responsibility on this matter and Iran is waiting response from Canadian officials." added Mehmanparast. Iran does not recognize dual citizenship. Based on rumors that Khavari had left Canada , the Canadian charge d'affairs was called for question on this regard . People protest against presidential election cheating in Iran-June 15,2009 - People won't forget the coup d'eta by Khamenei-Sepah and Ahmadinejad- This is people's power ! One day ,no one knows when the Iranian people will come out again & will wash away this mock regime ! 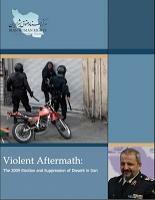 June 11,2012 three years after presidential election cheating by Khamenei- Sepah -Ahmadinejad ! On June 15 ,2009 Iranian people marched From revolution Square to Freedom Square in protest against presidential election cheating by Kamenei-Sepah & Ahmadinejad ! Silence March on June 14,2012 in all over Iran ! including parks in the cities on the evening of Thursday June 14 ,2012 in all over Iran from 7:00pm - 9:00 pm. Lives of Five Iranian from the province of Khouzestan is in great danger,reported ICHR. Abdolrahman Heydari, Tah Heydari, Jamshid Heydari , Mansour Heydari and Amir Maavi. One said usually when prisoners are transferred it will be done through prison guards but this time it was the especial unit from police force did the transfer.These prisoners were arrested during the one year anniversary of the uprising in the city of Ahwaz a year ago.Three of these prisoners are brothers.These five political prisoners are from the " Molashih " district in Ahwaz.The poverty driven Arab people of Ahwaz poured into the street 7 years ago and protested against the regime discriminatory policies. According to the families of these political prisoners , they have been deprived from their citizens rights and fair trial. Mohammad Sediq Kaboudvand the Kurdish-Iranian journalist and human rights advocate after 17 days of hunger strike is still on hunger strike . He has told his family that ; he may go to dry hunger strike. Mr. Kaboudvand told his family that; the prosecutor told him : "death or the hunger strike of political prisoners is not important for them." Reported by the Organization of Kurdistan Human Rights. Esmail Ahmadi Moghadam commander in chief of NAJA ( the Islamic Republic police Force ) told to reporter That: In order Khavari be brought back to Iran,the Interpol ( International Police ) need the judiciary order . This order was issued and Khavari as an accused is under persecution and we hope the countries will cooperate in his extradition . Iranian people must find a way to help release political prisoners. Nuclear Energy topic and discussion is a trap by Islamic Republic ,Human Rights issue and political prisoners issue is more important ! 1- Hossein Ronaghi Maleki the imprisoned Iranian blogger started dry hunger strike ,meaning No eating,No drinking.! 2- The 2nd political prisoner have died inside the Islamic Republic prison system and his name is seyed mohammad Mehdi Zalieh Naghshbandian ( A Kurdish politica prisoner- A wounded Iran-Iraq war veteran- was sentenced to life in prison for allegedly having tie with a Kurdish political party and had spent 18 years in Orumieh and Rejaei-Shahr prisons. reported HRANA ). Earlier Mansour Radpour another political prisoner died inside the prison from brain hemorrhage. 3- Jafar Afshari a Kurdish-Iranian has started hunger strike since Monday in Orumieh prison in protest to his sentencing. He was arrested together with his three brothers Ali Afshari, Razgar(Habib )Afshari and Vali Afshari in Kurdish city of Bukan and Mahabad by security agents.They were arrested in 2009 . Jafar and vali were sentenced to five years imprisonment and razgar and Ali were sentenced to death ,because of tie with Kumeleh Party. Regime continue to put pressure on other faiths practices ! Kambiz Tavana Iranian journalist for Radio Farda interviewed Mansour Borji the head of an Iranian church in London about a couple who were teacher in Emanuel church in Tehran and were arrested and there is no news on their disappearances.Mr. Borji said that; the churches inside Iran rather prefer to keep silence on the issue until later date which has negative effect. Mr. borji added that; Regime is afraid about the rise in number of Iranian participating in the churches on Fridays and Sundays prayers and puts more pressure on churches and in the past many church officials were arrested or in Dibaj case, he was murdered. 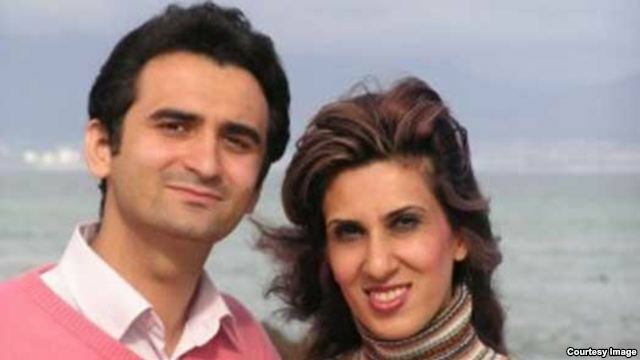 The couple were arrested are : Mehrdad Sajadi and his wife Forouq Dashtiani . According to report this couple were arrested on May 24 ,2012 and the report on their arrest was surfaced 10 days later. Mr. Borji said that; Regime has discriminatory policy towards the other faiths including Muslim's who think different from the official brand. 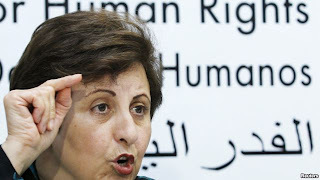 Shirin Ebadi and three human rights organization: Lives of Iranian political prisoners are in danger ! Precious peace-freedom loving young Iranian held in custody for years and one by one dies inside the Islamic Republic prison ! On Tuesday June the 5th Shirin Ebadi the Iranian Noble Peace Prize winner and three human rights organizations warned the Islamic Republic officials and humans rights organization around the world about the danger threatens the lives of political prisoners in Iran particularly the lives of Mohammad Sediq Kaboudvand Iranian Kurdish human rights advocate and editor of banned weekly "Payame Mardome Kordestan" , Narges Mohammadi journalist and spokesperson for the "Association of Human Rights defenders in Iran" and Hossein Ronaghi Maleki the Iranian blogger and human rights defender. Mohammad Sediq is on hunger strike because of violation against his rights inside the prison. Narges Mohammadi suffers from muscle paralysis and Hossein Ronaghi Maleki is on hunger strike and suffers from kidney disease. Shirin Ebadi: "We witness the suspicious death of political prisoners and inhuman behavior towards them inside prisons all over Iran particularly inside Rejaei-Shahr and Evin prisons. The danger of death threatens many political prisoners for instance Narges Mohammadi,Mohammad Sediq Kaboudvand and Hossein Ronaghi "
Hossein Ronaghi Maleki the Iranian imprisoned blogger who was on hunger strike and was transferred to hospital is banned from visitation! Judiciary power officials including Mohammad Sadegh Larijani himself is responsible for the death of political prisoners inside prisons in Iran. Hossein Ronaghi Maleki is an imprisoned Iranian blogger and a human rights advocate who suffers from kidney disease. In protest to his situation ,he went on hunger strike and in recent days many political prisoners from ward number 350 of Evin prison released statements warned prison and judiciary officials about Hossein condition and his immediate need for medical treatment and mentioned of those prisoners who have gone the same experience and died in the prison including Hoda Saber . Although he was transferred to a room in Hasheminejad Hospital where his parents could visit him but now the "Sepah intelligence" has moved him to another room and banned the family visitation and threatened family not to speak to media.Sepah agents threatened Hassan Ronaghi Maleki ( hossein's brother ) not to speak to media and asked him to keep quiet on his brothers situation. Hossein in his letter to the officials wrote: "In protest to unlawful actions , i'm going to start hunger strike from May 26 ,2012 . and the responsibility of my life is on Islamic Republic officials." He complained about the intervention of Sepah agents and Ministry of Information agents in his case. Hossein Ronaghi Maleki have been in prison for the last two and a half years without leave of absence .He was arrested on December 2009 in the city of Malekan close to city of Tabriz and was transferred to ward number 2(Alef) in Evin prison.He spent 10 months in solitary confinement cells.Regime is forcing him to video confession. He was sentenced by branch number 26 of the court of revolution to 15 years imprisonment. International Tribunal for Iran -1980's Massacre of Political Prisoners ! Ayatollah Mosavi Ardabili a powerful Ayatollah and head of judiciary councile after the revolution :The faiths/ beliefs are in danger, apologize from people ! Ayatollah Abdolkarim Musavi Ardabili : All the past and present Islamic Republic officials must apologize from the people of Iran !!?? On Thursday while speaking to a class of theology students Ayatollah Abdolkarim Mosavi Ardabili one of powerful Ayatollah and head of judiciary council in Iran after the revolution ,asked all officials to apologize from the people of Iran.!!?? He criticized the former and current officials including himself for past and present actions which brought Islamic Republic in the present situation. "I'm speaking on my behalf and not for others,i'm worry about, what i have done and what i haven't done.!!?? If all of us have done things different ,we wouldn't be in this current situation.We must honestly confess to the difficulties and apologize for the mistakes . Ayatollah Ardabili in the past during the presidential election rigging and people's protest in June 2009 had protested the way the officials handled the situation by using violence and force killing people.